DACS has been given a wonderful and rare opportunity by Mr & Mrs Harry Wills of The Beech Estate in Netherfield to hold two guided walks around their Coronation Meadows on 3rd and 6th June 2015. 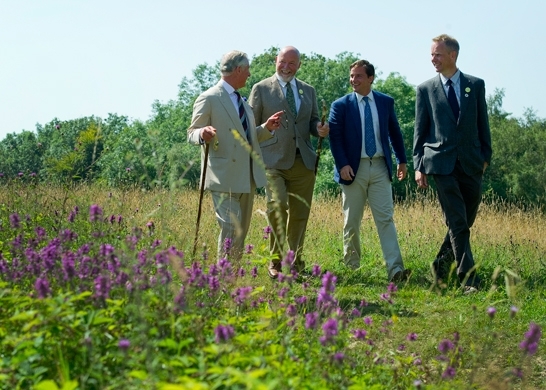 The Coronation Meadows were set up by HRH Prince Charles to celebrate the Queens’ Diamond Jubilee in 2012. There is one in each county in England, and The Beech Estate was awarded this position in East Sussex for the way they have preserved the historic biodiversity of the area. The walk will be led by Keith Datchler OBE who will give you a fascinating insight into the workings and preservation of a wildflower meadow. His work on this subject led to him receiving an OBE, and the walk you will be taken on will be the same one he and Harry Wills gave to HRH Prince Charles at The Beech Estate last summer. As The Beech Estate is private land, these tours are not generally open to the public, and DACS have been very fortunate to have been given two dates for fundraising. DACS has decided to give half the funds raised to the three Darwell parishes. Numbers are very limited (30 per day), and will be allocated on a first come first served basis on receipt of payment. Please apply by email and send a cheque along with the names of those attending and all your contact details by 30th April (see this invitation for details). On receipt of these, you will be emailed full information about the visit including directions/maps. We would be delighted to welcome non-members to this event. Please feel free to pass the details on to anyone you might think would be interested. Please click here to view the invitation, which contains details of how to apply.